October is the month most closely associated with markets going bump in the night – 1907, 1929, 1987, 1997, 2007, 2008. Of all the October surprises, the 1929 crash had the most lasting consequences. Stocks declined 50% in the two months of September and October, 1929. (See chart below.) Before it was all over in 1932, stocks dropped a breathtaking 90% and did not return the old high of roughly 380 until the mid-1950s – one-quarter century later. Imagine having a million dollars in stocks at the end of the summer 1929 only to watch your portfolio drop steadily until it was worth $100,000 by 1932. “This bull market has echoes of the late 1920s," Nobel laureate Robert Shiller recently told CNBC. "The 1920s is quite a legend that people are often thinking about. I look at 1929 particularly as the end of the roaring ’20s and it ended in a bout of speculation. Between May and September of ’29 the stock market went up over 30 percent in just a few months." When the Federal Reserve bailed out the financial system by purchasing U.S. Treasuries and mortgage-backed securities, it included those items as assets on its balance sheet. Much of that capital was then redeposited with the Federal Reserve as excess reserves creating a liability on the central bank's balance sheet. Now, the Fed with much fanfare is reducing the asset side of its balance sheet. What is often neglected in the analysis is that it is also reducing liabilities. The chart below is a big-picture representation of the Fed's balance sheet reductions – both assets and liabilities. In 2016, Federal Reserve bailout-related assets were roughly $4.5 trillion. Bailout-related liabilities were about $2.5 trillion. At present, assets are $4.2 trillion and liabilities $1.8 trillion. 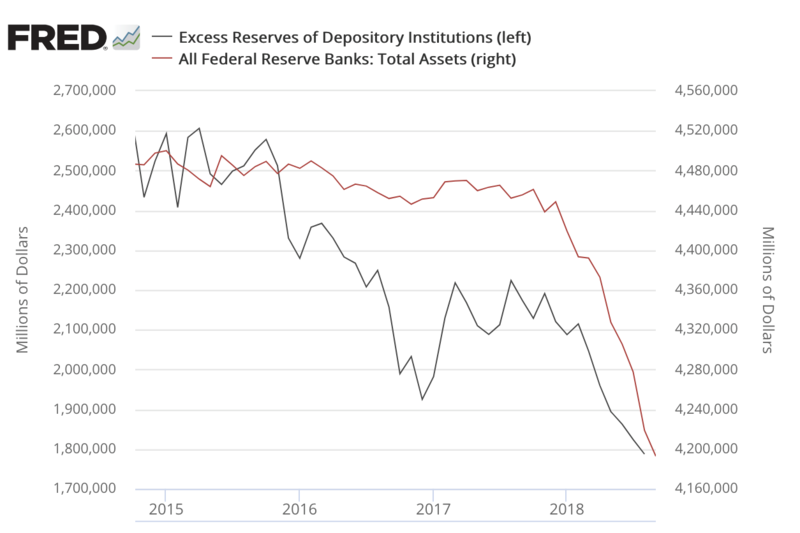 Since the process began in 2016, liabilities have run off the Fed's balance sheet at a much faster rate than assets, signaling the central bank's inflationary bias. Keeping in mind Milton Friedman’s widely accepted dictum that there is an 18 to 24 month lag between monetary stimulus and response, the first signs of inflation appear to be right on schedule. By September 2017 – two years from the initial draw downs – the official inflation rate had climbed back to the 2% mark. As of the September Consumer Price Index release, it had reached 2.8%. Keeping an eye on Italy. . . While the bulk of attention these days is centered on China and its economic woes, the markets are also keenly aware of the situation in Italy where its 10-year paper is taking a hit. The euro is collateral damage in the fray – down against the dollar today and adding to the drag on gold. At some point, one would think that the market sentiment associating this sort of thing with a stronger dollar will migrate to the bigger issue – an unraveling global economy and the very large systemic risks it represents. When that happens, gold will be understood again for what it is – a true depository of wealth that transcends the problems of nation-states and their currencies and, come hell or high water, a better alternative than the dollar. Shangdong Gold is state-owned. Its chairman’s optimistic view on gold’s future is particularly interesting when you take into account the current interaction between the yuan and gold. Does it tell us something about China’s intentions with respect to the yuan? China has publicly stated its interest in making the yuan a viable competitor to the dollar for international reserve status. One might read in all of this that Li Guohong and Shangdong Gold take that commitment seriously. By the way, those sales on the SGE are recycled to the nation’s population and banks which, in turn, are owned by the Peoples Bank of China. Acquiring mines, like the Valdero mine in Argentina, in our view, is a back-door scheme for China to build its gold reserves. Hussman recommends “humble cash” as the best option “because it offers opportunity to respond to deep market losses.” We would refine that a bit. Green cash is a good option under the circumstances Hussman describes. Gold cash is even better. Inflation could become an issue. If it does, gold can do things for you that green cash cannot – like appreciate, rather than depreciate, in value. The inflation does not have to rise to the level summarized in our accompanying photograph either. Historically, gold has proven to be a solid hedge against even comparatively minor doses of currency depreciation. September 30th marked the end of the U.S. government’s fiscal year. For the month, it added $58 billion to the national debt. For the fiscal year, it added $1.271 trillion to the national debt. For the calendar year thus far, it added $1.082 trillion to the national debt. At fiscal year end, the national debt stood at $21.516 trillion. “Central banks,” reports the World Gold Council, “added a net total of 193.3 tonnes of gold to their reserves in the first six months of 2018, an 8% increase from the 178.6 bought in the same period last year. This marks the strongest first half for central bank gold since 2015.” Since the beginning of 2017, the biggest buyers were Russia – 383.3 tonnes; Turkey –125.8 tonnes and Kazakhstan – 68.4 tonnes. A surprise on the list, and reported here earlier this month, is India – 15.3 tonnes. The Peoples Bank of China, who many analysts believe to be the largest buyer, does not report publicly on its purchases. Some sources report though that its purchases could be as high as 500 tonnes per year. 1. Don’t buy it because you need to make money; buy it because you need to protect the money you already have. 3. Don’t buy its paper pretenders; buy the real thing in the form of coins and bullion. 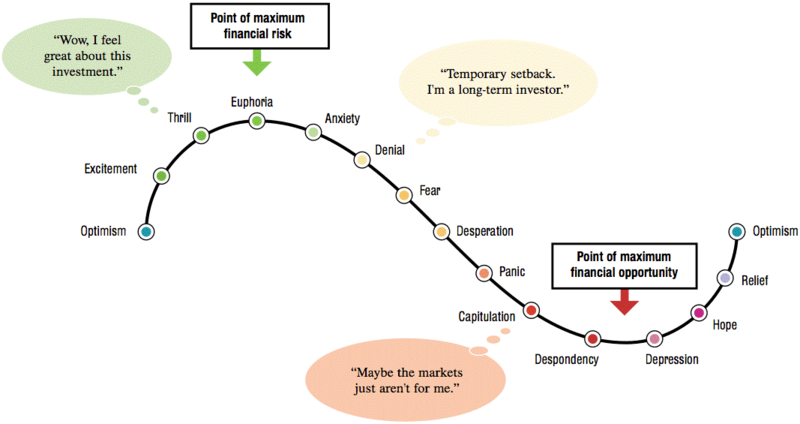 We guesstimate that we are somewhere between “thrill” and “euphoria” on stocks and “despondency” and “depression” on gold and silver. In short, the time might be right for starting to leg-out of stocks and ladder-into gold. Editor's note: Holmes goes on to suggest gold as a hedge against the latent pension crisis saying, “Historically, a defensive investment strategy has included a rotation into gold, bonds and other assets that are uncorrelated to the stock market.” Gold is an asset which is not simultaneously another’s liability. Pension funds by comparison are loaded with assets that are simultaneously someone else’s liability and carry precious little gold to offset the risks that represents. Editor's note: A view of the short term. . .Gold almost always surprises the bulk of short-term traders both to the upside and downside. It can move either loudly on a convergence of issues or quietly on what seems nothing at all. Even more surprising, it can confound traders by moving long after the experts predicted it would (or should) – as was the case following the early tremors in the 2008 financial earthquake.